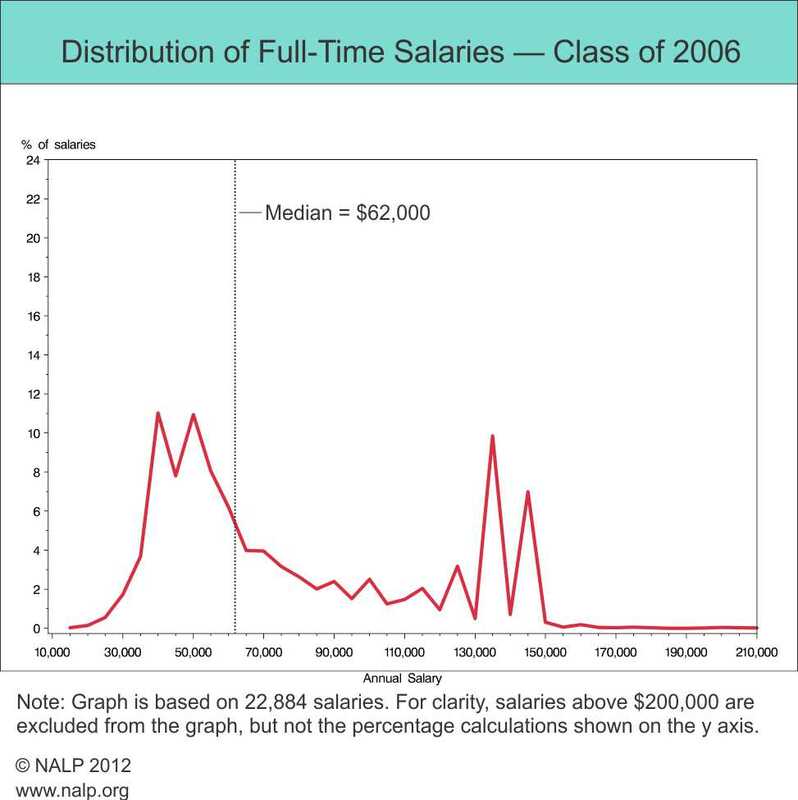 Starting with the Class of 2006, one of the ways NALP has documented salary information for law school graduating classes is with a picture — a picture which shows very clearly that the salary distribution for law graduates has two distinct peaks, one in the $40,000 to $65,000 range, and one reflecting the big-law salary (or salaries) typical for that year. The full range generally spans from less than $20,000 to over $200,000. 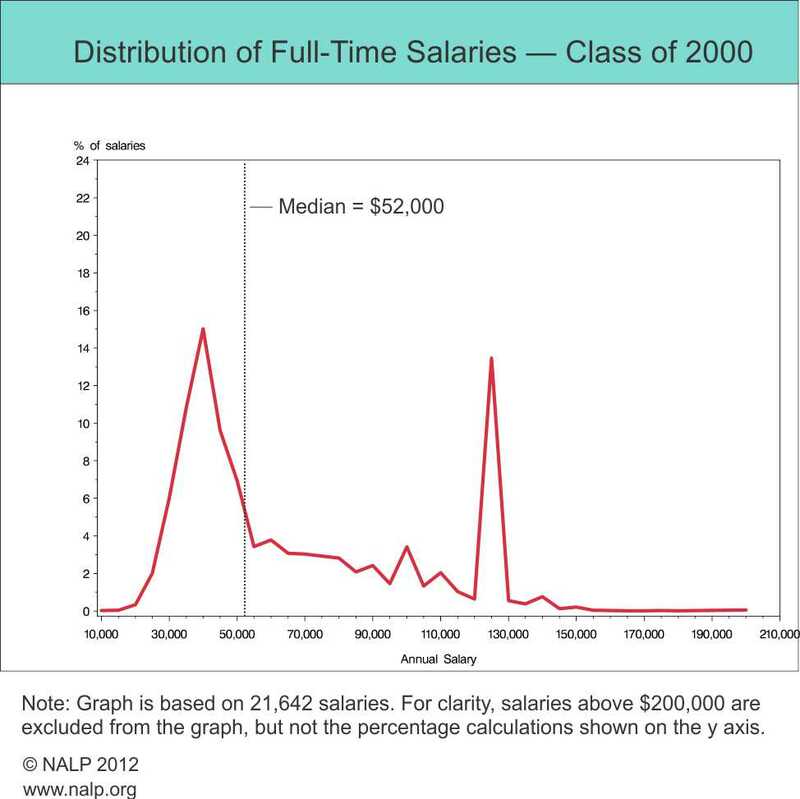 Although such a range of salaries is nothing new, the doubled-peaked characteristic was first apparent with the Class of 2000, with the evolution of the double-peaked curve documented in the January 2008 NALP Bulletin. This column reviews that earlier work and updates it to the Class of 2011. 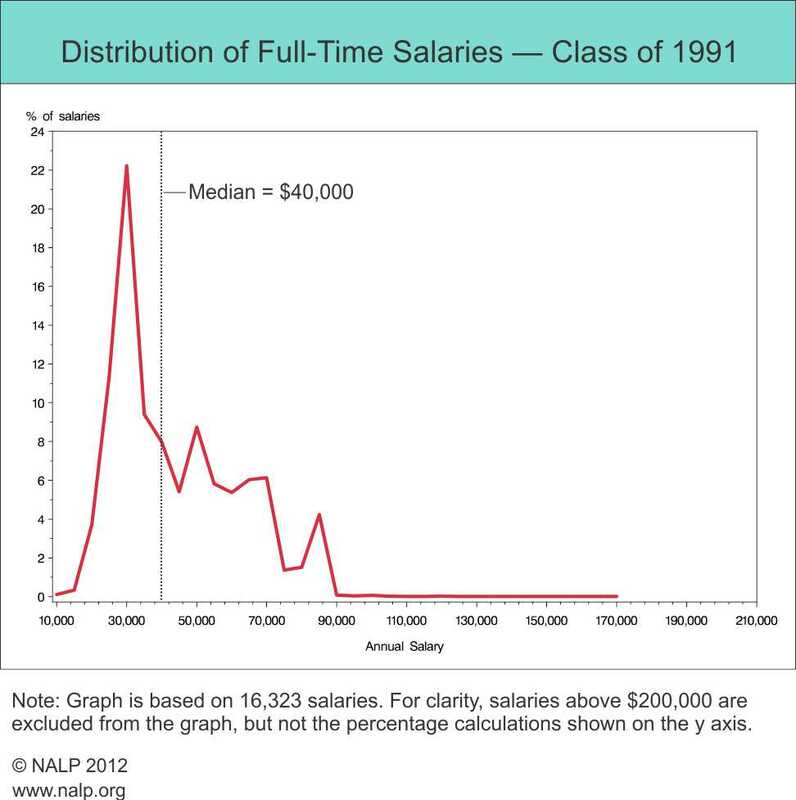 Back in 1991, salaries ranged from about $10,000 to about $200,000. 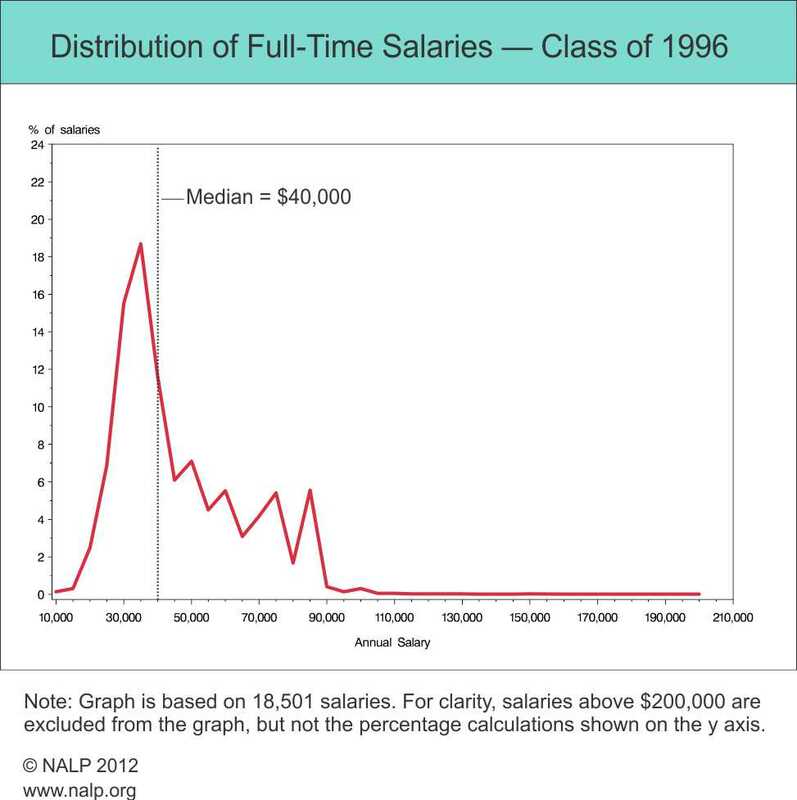 Though hardly a normal "bell-shaped" curve, the 1991 curve shows some resemblance to one, with a big clustering of salaries (about 40% of salaries reported) in the $30,000 to $40,000 range and just 6% of salaries at $70,000, the median in big law firms at the time. In 1998 and 1999, the marker again moved to the right, to $90,000, and about 6% of salaries. This corresponds with a period of salary increases, moving the median at firms of 251+ lawyers from $72,000 in 1995 to over $90,000 in 1999. The shift notwithstanding, the overall distribution maintained the basic, though lopsided, bell shape. That shape changed dramatically in 2000 as large firms increased their starting salaries to $125,000. Beyond just the amount of the increase, of more consequence for the salary distribution was how widespread the increase was. Suddenly nearly 14% of salaries were reported at $125,000, a proportion that can only be partially explained by an increasing percentage of jobs taken in large firms. The result was, for the first time, two peaks, with the other encompassing the $30,000 to $50,000 range. Thus, even though the peak to the left was now fatter and accounted for more salaries — 48% versus the 14% at $125,000 — never before had a single salary so dominated the landscape. The $125,000 peak remained through 2005. By 2006, the $125,000 peak had disappeared, replaced by two smaller yet very distinct peaks at $135,000 and $145,000, which together accounted for 17% of salaries. At the same time, salaries in the left-hand peak, at that point between $40,000 and $65,000, were still more common (48%). In the three years that followed — 2007, 2008, and 2009 — the right-hand peak shifted to $160,000, accounting for 16%, 23%, and 25%, respectively, of reported salaries. Meanwhile, the $40,000 - $65, 000 peak shrank, accounting for 44%, 42%, and 32%, respectively of reported salaries. The increase tracks the increasing share of jobs in the very largest firms (more than 500 lawyers) from 12.8% of jobs in 2007 to almost 14.3% of jobs in 2009. Again, however, the widespread adoption of a single salary contributed to and magnified the increase beyond what would have occurred based just on the share of jobs. Things began to change in 2010, when the recession more fully impacted law firms, affecting the Class of 2010 in many ways, including a marked shrinking of summer classes in 2009. This resulted in the right-hand peak eroding back to 18% of reported salaries, and the left-hand peak bulking up to almost half (48%) of reported salaries. The erosion continued in 2011, with $160,000 salaries accounting for 14% of reported salaries, and $40,000 - $65,000 salaries accounting for over half (52%) of reported salaries. 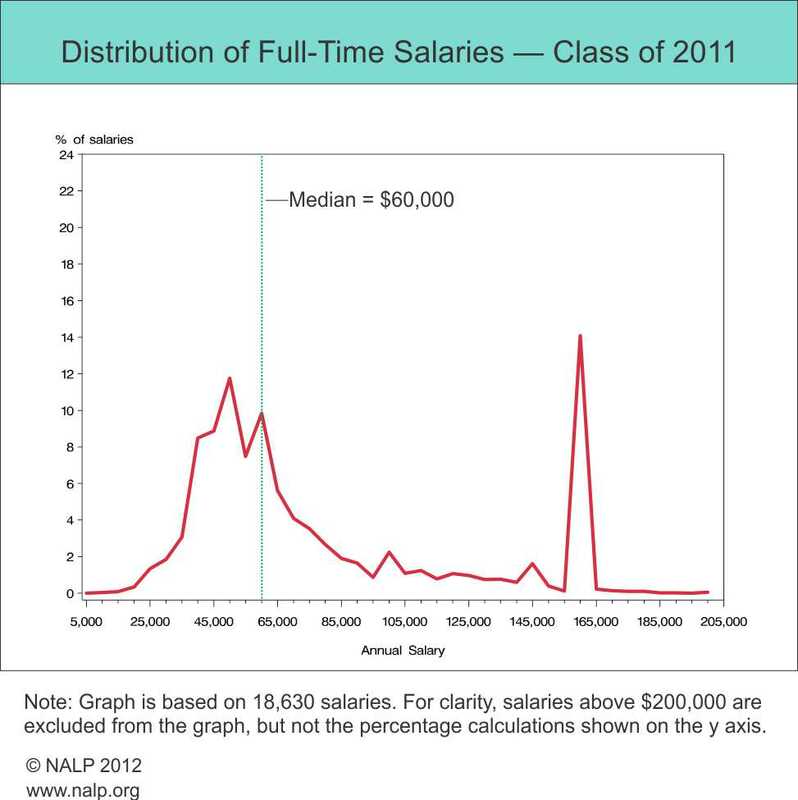 Finally, with so many salaries returning to the left-hand peak, the median salary — $60,000 for the Class of 2011 — again reflects the salary, or close to the salary, actually obtained by many grads. How the two peaks shift in the future remains to be seen. For example, will the right-hand peak revert to two peaks, one at $145,000 and one at $160,000? The return to a semblance of bell curve seems unlikely, however.